ONSEN YUNOHANA (Address: Otaru-Shi Temiya 1-5-20, Phone (0134) 31-4444) EXCLUDES FOREIGNERS FROM ITS OPENING DAY, JULY 1998. The tall photo on the left was taken on Sept 19, 1999 in front of Yunohana "Onsen" bathhouse, a large-scale family-oriented bathhouse in Otaru. As you can see, it is not of the "massage parlor" genre, and establishments like these are very much an important part of the recreation industry in Japan (where it is socially very ordinary for Japanese to take a weekend off, visit a place like this, and soak for hours between meals). Denial of access to places like these is culturally like denying someone access to a sushi shop. It the first onsen that Plaintiffs Olaf Karthaus and Arudou Debito (ne Dave Aldwinckle) visited with four other international families and friends, on a factfinding mission under the aegis of NGO Issho Kikaku. (Report for Issho Kikaku by Dave Aldwinckle here). However, as the sign in English proved highly photogenic in the international media, it would be replaced. See two sections below. 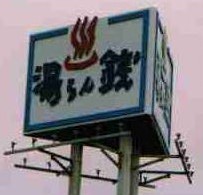 ONSEN OSUPA (near Otaru MyCal, Address: Otaru Chikkou 7-12, Phone (0134) 25-5959) EXCLUDES ALL FOREIGNERS WITH THIS SIGN FROM MID-1994. 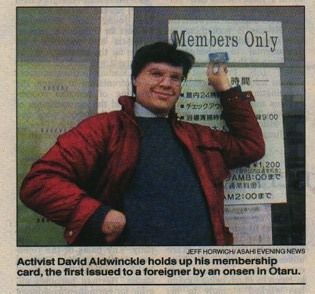 The same group mentioned above then visited Otaru Osupa in the evening of Sept 19, 1999, and were duly refused entry. More of course within the Issho/Aldwinckle REPORT above, but this sign had been up for over five years, and Otaru City apparently did little to stop it. 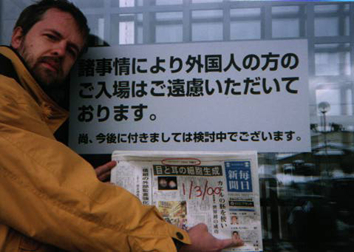 NEW YEARS 2000: ONSEN YUNOHANA REPLACES THE JAPANESE ONLY SIGN WITH A NEW ONE IN JAPANESE ONLY. 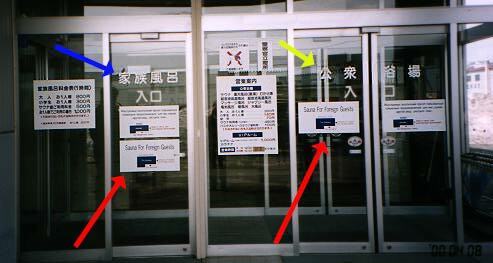 It still refuses foreigners by saying, in translation by Arudou Debito, "Due to various circumstances, we are refusing entry to foreigners. Furthermore, we will be deliberating on this policy from now on." This "deliberation period would stretch stretch out for over a year--even for two and a half months after Arudou Debito went to the onsen on Oct 31, 2000 to be refused as a Japanese citizen. It ended suddenly when our intention to sue was made public on Jan 16, 2001; within 24 hours, within the wee hours of Jan 17, 2001, the sign was down and replaced by two photocopies--outlining bathing rules provided by the city, and four conditions for entry for foreigners only. But only, of course, after sixteen months (Sept 1999 to Jan 2001) of fruitless negotiations with Yunohana and hand-wringing by the Otaru City authorities. The reason why Olaf is holding that newspaper with the date writ large on it is because we had heard from little birds that Yunohana and Osupa were intending to take their signs down for the New Year. So to check, Olaf and Dave again under the aegis of Issho did some new-year greetings on Jan 3, 2000. Since it wasn't the case, we bought some newspapers to prove the date was past the Jan 1 deadline. 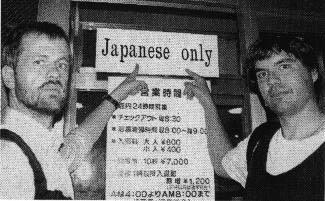 Anyway, so what happens when unwitting foreigners who can't read Japanese find themselves stumbling into Yunohana to be refused? 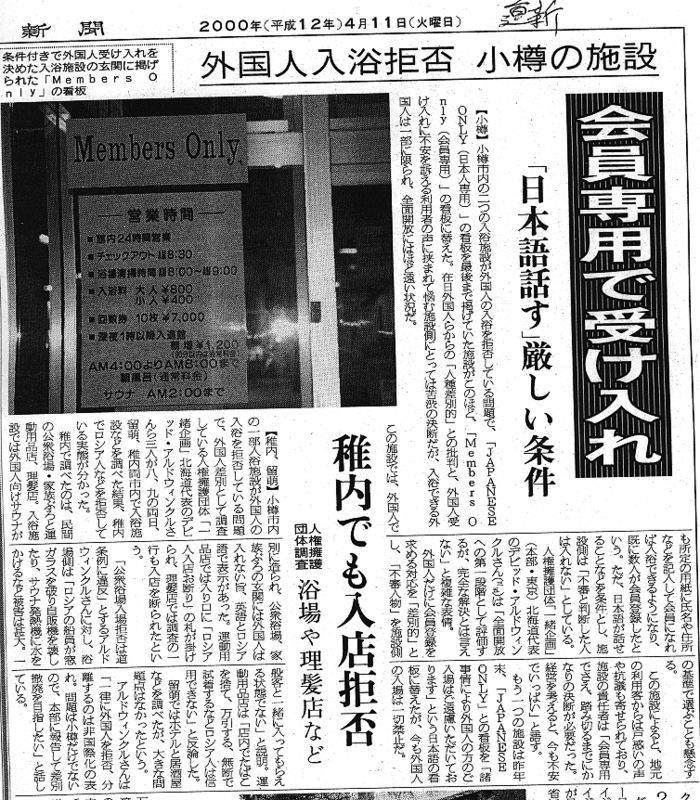 According to the Asahi Evening News, April 11, 2000, Yunohana now employs Russian- and English-speaking staff to turn foreigners away in their own language. 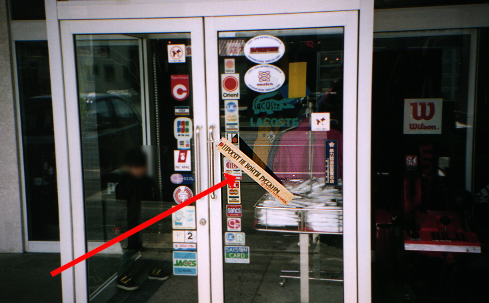 MARCH 2000: THE "JAPANESE ONLY" SIGN AT ONSEN OSUPA IS REMOVED IN FAVOR OF A SIGN SAYING "MEMBERS ONLY"
Sound like a compromise, but the system is only applied towards foreigners and the conditions for membership are 1) applicant's ability to understand Japanese, 2) preference given to people with families, 3) foreigners not coming in large groups, 4) the judgement of the person at the front desk at the time. Also, a Yomiuri Shinbun Otaru reporter told Dave Aldwinckle that Japanese are not checked for cards, and Osupa's mamager Mr Ohkoshi told the same that people who were Osupa members before will not be issued cards. In any case, Mr Ohkoshi insists that the sign is only temporary, but it will soon be a full year of a temporary sign. We shall see. JANUARY 17, 2001. THE REMAINING OTARU BLANKET EXCLUDER, YUNOHANA, REPLACES ITS EXCLUSIONARY SIGN WITH FOUR CONDITIONS FOR FOREIGNER ENTRY. The small print is that this happened only when information on our intent to sue was made public on January 16, 2001--i.e. only then did sixteen months of fruitless negotations bring any results--and within 24 hours. However, those four conditions are just as problematic. Moreover, this event falls outside of the timeline for this particular webpage. Click here to go to Recent Developments. Why is this such an urgent issue? It might sound less disturbing if these were isolated cases in one backwoods town. But they are not. Quite the contrary--the problem is spreading. SEE FULL REPORT IN ENGLISH ON AN APRIL 2000 FACT-FINDING MISSION HERE. This is an onsen in Wakkanai, the northernmost city in Japan, called "Yuransen" (Wakkanai-Shi Suehiro 3-6, Ph (0162) 24-2619--see sign at right), which actually provides separate entrances for foreigners. There are three segregated facilities--the REGULAR BATHS, which as offically-recognized Public Baths (Koushuu Yokujou) cost 360 yen to get into (460 additional for sauna entry), and FAMILY BATHS, which cost 800 yen; both of these facilities are forbidden to foreigners. 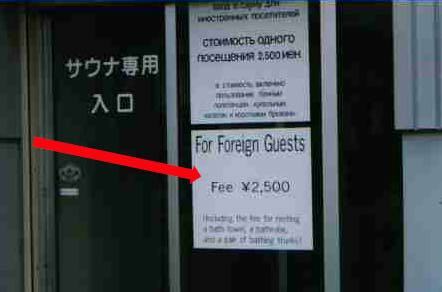 The third facility is the SAUNA FOR FOREIGN GUESTS (see pictures below), where foreigners pay a flat fee of 2500 yen (including rental of towel, trunks, and bathrobe). This is in violation of Section Two, Clause 1 of the Hokkaido Public Bath Ordinance (Koushuu Yokujou Hou Shikou Jourei, Hokkaido Jourei No 3), which establishes that Public Baths are "necessary and essential" (hitsuyou fukaketsu) enterprises for the public health of "regional residents" (chiiki juumin)--which of course includes taxpaying foreigners. Governmental awareness of this activity has been confirmed by Mr Kouno, Wakkanai Hokensho Seikatsu Eiseika Kankyou Eisei Kakari (ph. 0162-23-6161), who acknowledges this exclusion of foreigners but claims they are powerless to stop it. Moreover, this flaunting of the law has an important impact on the atmosphere of enforcement. Mr Ohshima, owner of the Wakkanai franchise of the Yuransen chain, told Dave Aldwinckle on April 9, 2000, "Everyone know's I'm doing this, and nobody has stopped me. So it is not illegal." Moreover, Mr Ohshima told Olaf Karthaus, fellow coordinator of this project, who was turned away at the door on August 10 1998, 4pm, after cycling 141 kms: "Well, Otaru is doing it, so so can we." Yes, that's 2500 yen, over six times as much. Of course, it does say underneath (sorry it is so hard to read), "Including the fee for renting a bath towel, a bathrobe, and a pair of bathing trunks", which might sound closer to value for money. But foreigners don't get the choice--many certainly don't need to "rent" bathing trunks. Plaintiff Arudou Debito/Dave Aldwinckle went inside the Gaijin Baths with Mr Ohshima on April 9, 2000, and attests that the tubs and sauna are significantly smaller than the Japanese-only side (this was also confirmed by the manager, Mr Ohshima). Most tellingly, the definition of "foreignness" for these exclusionary onsen starts from puberty. This was seen at Yuransen on July 30, 2000, 1pm, when Hokkaido International School's basketball coach Adam Fraser cycled from Teshio to Wakkanai (a distance of 110 kms) accompanied by four of his male international students. One Japanese/American student was 14 years old and living in Japan eight years, another Japanese/American was 16 years old living in Japan five years, one American had lived in Japan twelve of his 16 years, and one South African boy was born in Japan and lived here all his life. All students spoke fluent Japanese and knew Japanese bathing customs from a very young age, yet all were refused at Yuransen's door and told to go the Gaijin Bath. The two Japanese-American students eventually mentioned their dual nationality and were let in, but the Caucasian coach and his two other Caucasian students were left standing outside until they finished. There is no other onsen within 15 kms (i.e. a long bikeride) of Yuransen (NB: there are bathing facilities at downtown hotel, but it is not an official public bathhouse), the stranded three eventually got the sweat off their bodies by bathing in the salty sea. This silliness must stop as it is thusly affecting our children, the ultimate innocents under these policies. Here is a photo of the storefront. Karthaus and Aldwinckle entered Shidou Sports and asked about what the sign meant, and if we as foreigners were permitted to be in here. The staff said, "It means no Russians may enter," and then went on to indicate that we should not be in here. When we asked about our friends in Wakkanai who said they were excluded from this store, yet were not Russian and spoke Japanese, the staff said that foreigners should be accompanied by Japanese who will take responsibility for them. Why? "Russians shoplift, throw cigarette butts on the linoleum floor, try on clothes and leave their body smell (taishuu) on them, and generally scare the Japanese customers." That may indeed be a problem, but store's anti-Russian policy is also applied to all unescorted white foreigners. PROGRESS REPORT: (As of August 2000, thanks to Issho Kikaku checking to confirm.) Shidou Sports did in fact take their sign down. But according to Issho, they are still unconvinced that excluding is the wrong thing to do. 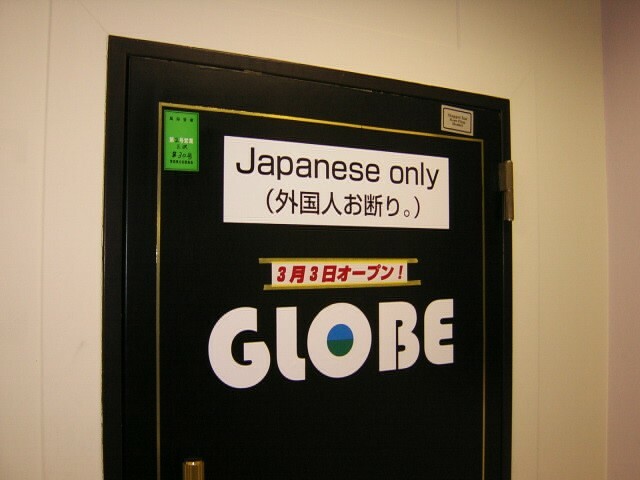 According to our Wakkanai source, this place refuses foreigners even if they speak Japanese. Since there is no sign out front to that effect, Aldwinckle walked in to investigate, and was promptly given an X-sign with folded arms by the proprietor, who was halfway through a different head of hair. After Aldwinckle asked quietly, "Gaikokujin okotowari desu ka" (Are foreigners refused? ), the proprietor, who understood the Japanese, said "Sou desu" (That's right). As the proprietor was busy, Aldwinckle thought it best not to inquire further, but the question remains: If onsens have a problem with foreign hygiene and stores with pilfering, what problem would a barber have with foreign hair? As Karthaus and Aldwinckle were accompanied part of the way by a Wakkanai Hokkaido Shinbun reporter, these cases became the basis of an article which appeared on April 11, 2000 (Japanese jpeg). PROGRESS REPORT: (As of August 2000, thanks to Issho Kikaku checking to confirm.) Although there never was a sign up, the barber has apparently rescinded his blanket-exclusion policy. (This is "Kitami Monbetsu", on the Okhotsk-Sea side of Hokkaido. Not to be confused with "Hidaka Monbetsu" town within the Hidaka Mountains). 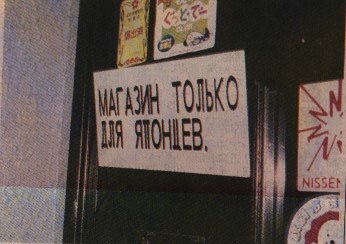 It reads, "Japanese-Only Store", and proprietors refuse service to all foreign-looking peoples, even including those who do not read Cyrillic. This was confirmed during a visit by Issho Kikaku's Tony Laszlo on August 21, 2000. What makes this case egregious is the fact that it is not an isolated incident. 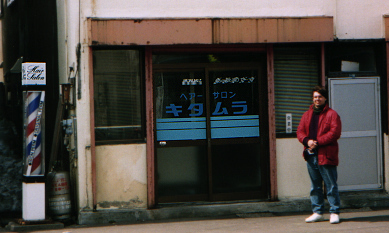 In fact, Monbetsu City Restauteur's Union (Inshokuten Kumiai) took orders for the signs back in 1995, produced them, and about 100 shops--i.e. about half the shops in the union--displayed them. 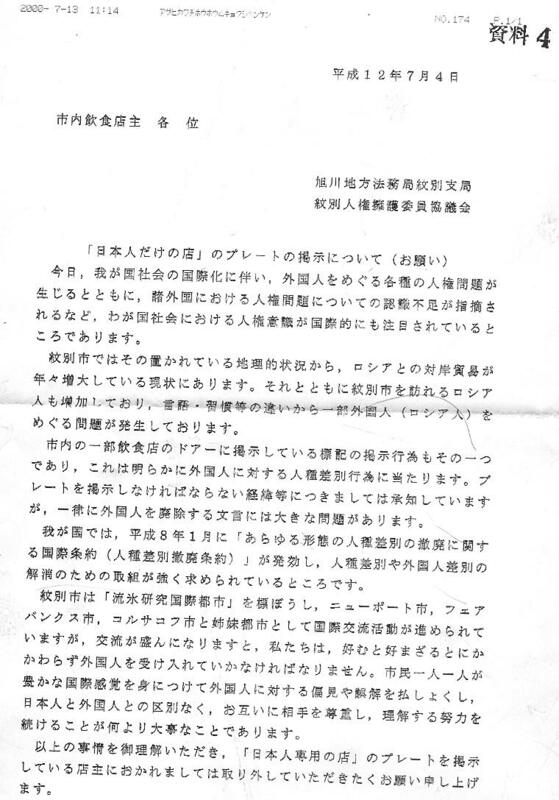 This occurred even after a warning from the Ministry of Justice's Division for Human Rights (Jinken Yougobu) issued a warning letter to the union (click here to see it in Japanese) on July 4, 2000, advising them to cease this activity. 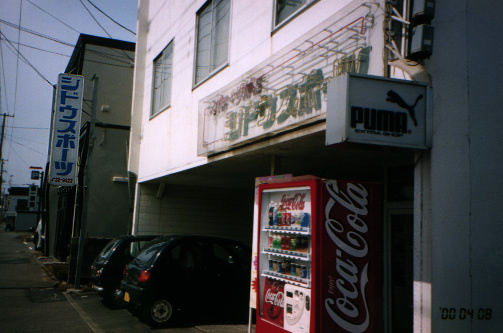 After substantial media attention (the photo article above being but one example), a few shops relented, but Issho Kikaku estimates that as of December 10, 2000, the number of shops displaying the signs was approximately 55. Moreover, the City of Monbetsu has shown an unwillingness to deal with the problem. 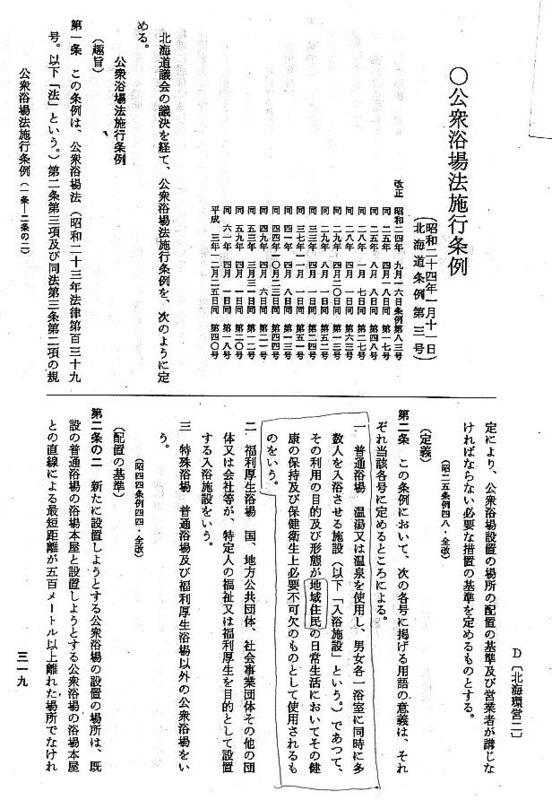 Monbetsu received a petition (see sample petition here in Japanese, page one, page two, submitted in slightly different forms also to Wakkanai, Otaru, the Hokkaido Government, Hamamatsu, Tokyo, and Shinjuku) calling for the establishment of a local ordinance (jourei) against racial discrimination. However, according to Issho Kikaku, Monbetsu (and Wakkanai) rejected the petition for deliberation by the assemblies' committees or in their general sessions. The other cities, Shinjuku, Hamamatsu and Otaru, voted to "continue to deliberate" (keizoku shinsa) over this issue (which means, according to sources within the Otaru City government, that submitted petitions die if not approved by the next city election). Substantiation of these developments here. Therefore, these activities are not just a couple of isolated shops, or even limited to a locality. Discrimination against people based upon race or physical features is happening with Japanese government acquiescence despite Ministry of Justice entreaty and international treaty. Finally, what makes this incontrovertably an issue of race, not nationality, is that Plaintiff Arudou Debito, despite receiving Japanese nationality on October 10, 2000, was denied entry to Defendant Yunohana Onsen in a tape-recorded incident on October 31, 2000. The reason? Even though Yunohana acknowledged Arudou's proof of Japanese citizenship (his driver licence), his foreign-looking features would allegedly make the regular Japanese customers want to stay away. For more information on this incident, please return to the Otaru Lawsuit Index page by clicking here. Need even more information? Click to go to Issho Kikaku's REPORT ON RACE-RELATED EXCLUSION--which includes detailed reports on these and other cases around the rest of Japan. Sunakku "Globe", Misawa-shi Chuo-chou 1-Chome 5-28, Miyabe Bldg 3F, ph 0176-52-2416.